When I think of Berlin, the first thing I remember was how I felt when I was there (lonely and depressed), followed by an image of the Berliner guy who propositioned me on the subway. 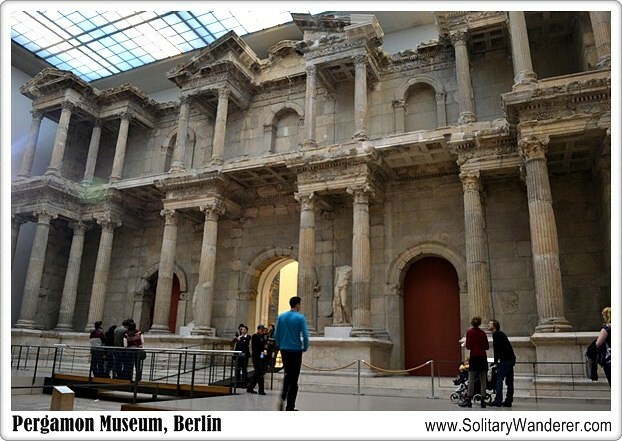 These two memories of Berlin are so vivid in my mind that I have quite forgotten how impressed (and awed) I was when I went inside a must-see attraction in this great city: the Pergamon Museum. I haven’t written much about museums in my blog. I’m not much of a museum goer (sorry, I’m not cultured! LOL), and I usually travel on a budget, which means steep admission fees are out of the question. 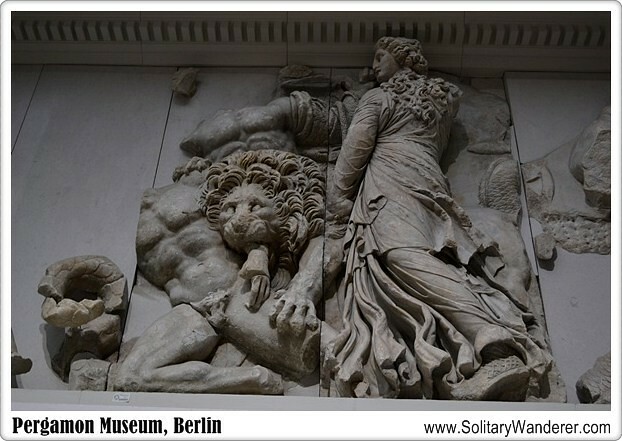 The Pergamon is just one of the many museums in Berlin’s Museum Island. What makes it very interesting is that it houses huge reconstructions of architectural pieces, featuring mostly original materials taken from various countries. The huge Pergamon Altar (photo below) and the Market Gate of Miletus, for example, are original structures taken from Turkey. Why are these in Berlin and not in Turkey? Well, this controversy has yet to be resolved. Maybe someday these structures it will find its way back to its native homeland. In any case, the Pergamon is actually three museums in one: the Collection of Classical Antiquities, the Museum of the Ancient Near East, and the Museum of Islamic Art. I regret spending only a couple of hours there; it was already mid-afternoon when I came in. There is so much to see and so much to appreciate that I recommend going inside early in the day. Here are some of the Pergamon Museum’s most impressive displays. Built in 1930 to house the huge reconstructions of buildings excavated in Turkey, the museum houses one of its most impressive exhibits: the Pergamon Altar, from which the museum got its name. The Greek altar dedicated to Zeus was built in the 2nd century BC in the acropolis of Pergamon in Turkey. It has been reconstructed inside the museum and its wide stairway is very popular with visitors, as well as its friezes showing battle scenes between the Giants and the Olympian gods. Reconstruction of the friezes, however, is still ongoing. 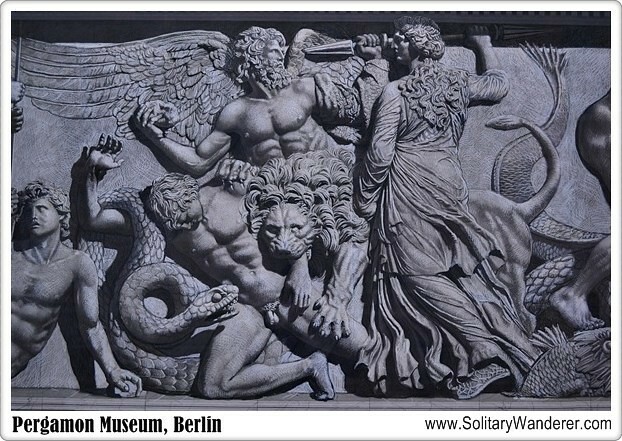 The photo above, for example, shows the goddess Keto attacking a giant with her lion in defense of her father Pontus. Below shows what the frieze will look like when the reconstruction is done. 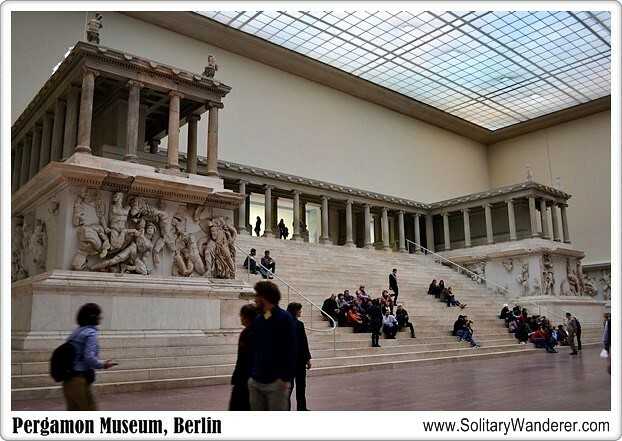 The Pergamon Altar will be closed for renovation for three years starting October 2014. Aside from the Pergamon Altar, another magnificent structure in the same collection is the Roman gate which led to the market of Miletus (photo below). Built in the second century AD, this huge structure was excavated in the early 1900s by German archaeologists . The present gate inside the museum has more than half of the original stonework collected from the excavation site. 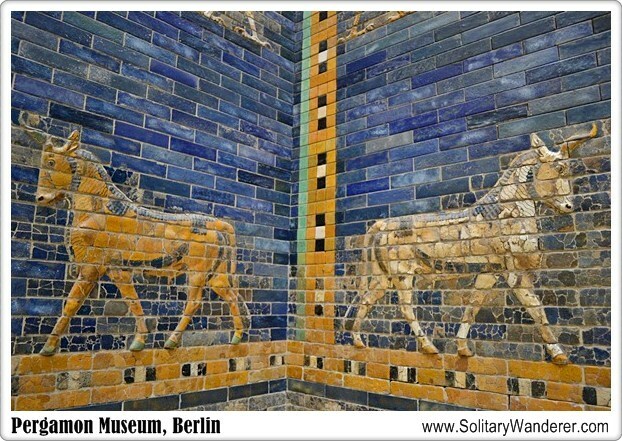 When you walk through the gate of Miletus, you will come out at the Ishtar Gate of the ancient city of Babylon. It’s actually just the smaller, frontal entryway. The big one doesn’t fit in the museum and is in storage. Built in 575 BC, the gate was made of lapis lazuli (the blue stone) and decorated with figures of dragons and aurochs, the ancestor of the present-day cattle (below). It was once one of the Seven Wonders of the world, as part of the walls of Babylon, before it got replaced by the Lighthouse of Alexandria. If the Near East and the Antiquities collections can take your breath away with its magnificent structures, the Islamic Art Museum will give you a feast of the senses with its numerous works of art from the Middle East. There are a lot of architectural decorations, wood carvings, and textiles (first photo) in this section. 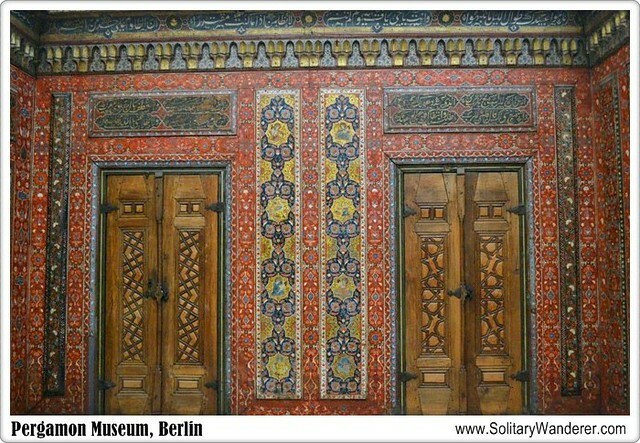 The picture below, for example, shows the painted panels that form part of the entrance to a rich merchant’s house in the old city of Aleppo in Syria. 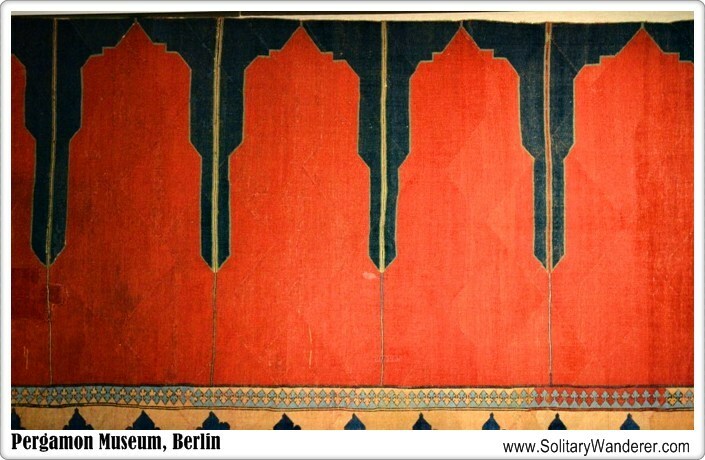 There are many, many more treasures that can be seen inside the Pergamon Museum. 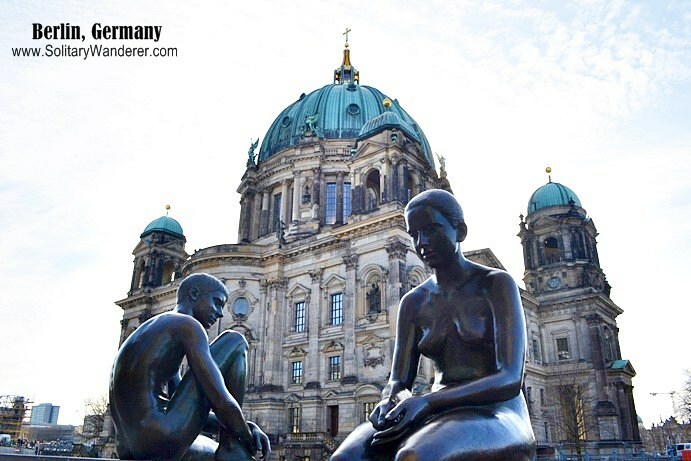 If you want to find out more about city breaks to Berlin, which include the Pergamon and other things to do in the city, just check out the site. If it turns out that you can only go inside one museum, better make it the Pergamon. While its ownership of the artifacts are being questioned by some people, no one can deny the fact that the collections are remarkable. See it while you still can! Have you been to the Pergamon? Which exhibit do you like best? @ Melvin: I hope you can get there before they close it. They’re supposed to close it this year for renovations. WoW! I thought only the british museum had temples inside it. Thanks for sharing this. I hope i get to visit this place when i get a chance to return to europe. @ Gladys: Thanks for dropping by. 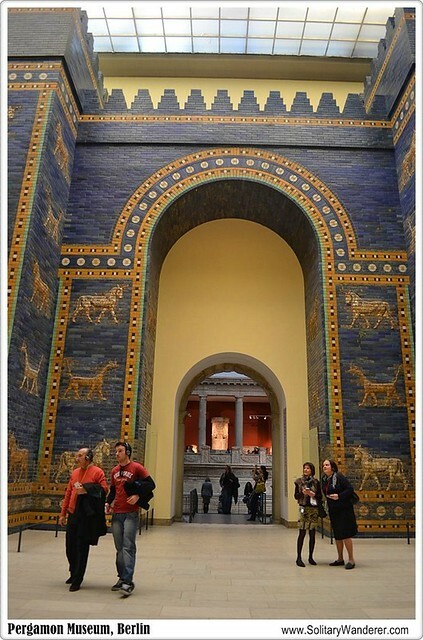 The Pergamon is really highly recommended for anyone traveling to Berlin. @ Michelle: You’ll definitely enjoy it! @ Julie: It’s hard sometimes to appreciate exhibits like this when there are so many people, but yeah, when you take the time to think about it, incredible is indeed the right word. They´re artefacts of stunning scale – I mean, you don´t see a museum with entire buildings in it every day. I learned a lot during our visit. It was very busy when we went and the cashier as well as the coat check people were a bit cranky. But after moving on from those experiences, and entering the actual museum, we really enjoyed ourselves. When you stand in front of the Ishtar Gates and realize that this used to be one of the gates of Babylon..that´s just incredible..
Beautiful pictures you’ve got there! These museums will be additions to my long travel bucket list. Thanks for the tips! @ Dana Carmel: Have fun on your Euro trip! So excited for you! @ Claudia: I would love to live in Berlin for a few months so I can visit all the museums. There are so many there. @ BertN: That was a really long time ago, Tito Bert. Time to visit it again! I’ve been to Pergamon but it was so long ago(early ’70s)I can’t even recall what I saw there. I’ve been back to Berlin two other times but it never came to mind to revisit. Next time I will, thanks to your post. It is indeed a MUST, I had the chance to visit it several times while living in Berlin and I never felt bored or disappointed, all the way round, I learnt new things in every visit. 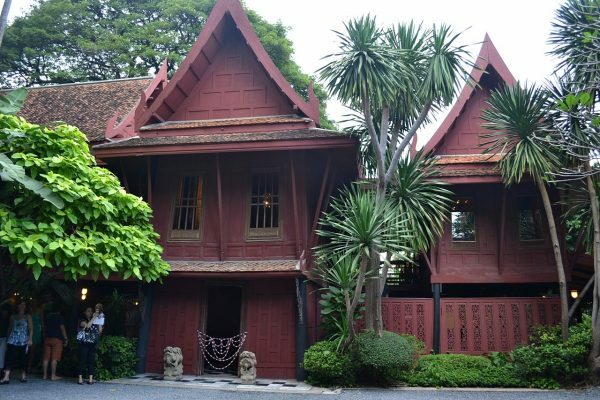 @ Kayla Seah: It’s definitely a must-visit! @ Mike: It really is fantastic to think they still have it there intact despite its age! @ Photo Cache: Me too! wow this has been an enlightening read. i haven’t heard of this museum before and it is interesting. i love museums but i don’t get to many because of the admission price, above my budget usually. I’ve been thinking about taking a day off to see the Pergamon for a while… you’ve just convinced me!